If you’re on Facebook and could click that little “like” button up there I’d sure appreciate it! The chocolate version of this recipe can be found by clicking here. Today I’m going to attempt to keep this blog post short and sweet. Well, the recipe makes it sweet but the only way we’re gonna make it short is if I’m not quite so chatty. Yeah….good luck with that one. But I have pies to bake, errands to run, and books to write so I’m gonna make an attempt. It’s the thought that counts, right? These cookies are the ones you most likely remember from your childhood. We usually had them in chocolate form (click here to view my mama’s tutorial on how to make the chocolate ones) but I somehow ended up with an entire family who LOVES peanut butter. Anything Peanut butter. Seriously. We go through one of the HUGE jars each and every week. They love PB&J sandwiches, peanut butter on toast, Peanut butter balls (which I try to always keep in the freezer), Peanut Butter Cookies, oh! And of course Yellow Cake with that Peanut Butter Fudge Icing. There is a cute story about that, too. When I did the 700 Club, I made seven different cakes and talked about The Seven Cakes of Christmas story from my family (You can watch all of my tv clips by visiting this page). Well lo and behold I arrived back in Alabama that night and my whole family met me at the airport, including a very exuberant Katy Rose, who hugged me and immediately started craning her neck to look around at my luggage. So what are we waiting for? Oh, yeah, we’re waiting for me to stop talking and get to the recipe, huh? Alrighty then, do I need to tell you how good these are? Fudgey, chewy, and every kid’s favorite. I think we’re all about due for a batch today! You’ll need: Sugar, oats, peanut butter, vanilla, butter (or margarine), and milk. 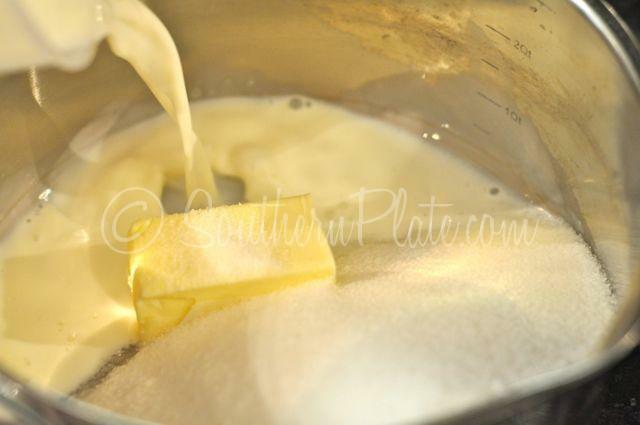 Place your sugar, butter, and milk in a heavy bottomed saucepan. Stirring constantly, bring it to a boil over medium heat. 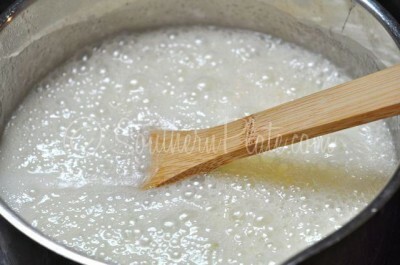 Once it reaches a full rolling boil, continue to stir and boil for one minute. I usually boil for a minute and a half to be on the safe side. 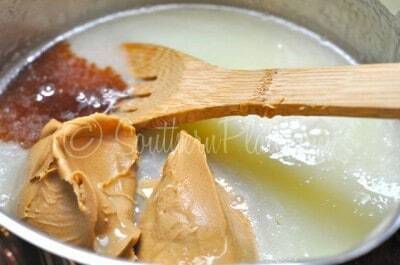 After it’s boiled for a minute, remove from heat and add in peanut butter and vanilla. 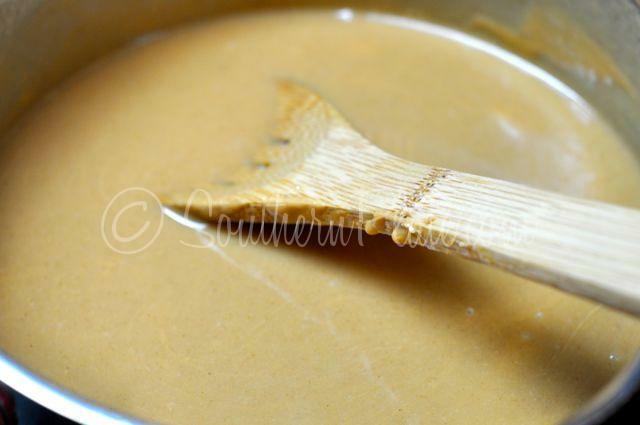 Stir until smooth, creamy, and all of the peanut butter is melted. 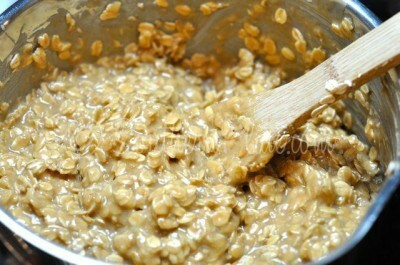 Now add in your oats and stir those up really well. That’s just my theory anyway. I love looking at the photos but I’m not too terribly into taking them, as you can tell by looking at mine. So many food bloggers take these gorgeous photos of all of their food but I’m kinda just more into cooking it, telling the story behind it, and then feeding people. Okie Dokie, now pour that into an 8×8 pan that you’ve sprayed with cooking spray and let sit until cool. Of course, if you want you can drop these by spoonfuls onto waxed paper like we did back in the old days. I just prefer the pan method because it is so much less work and they make cute little cookie bites when you cut them. You can speed up the cooling process by placing your pan in the fridge. Oh goodness, these are good! Did you have these as a kid? Who made them for you? Place butter, sugar, and milk in heavy sauce pot. Bring to boil over medium heat, stirring constantly. Once it reaches a full rolling boil continue to stir and boil for one to one and a half minutes. Remove from heat and stir in peanut butter and vanilla until peanut butter is melted. Stir in oats. 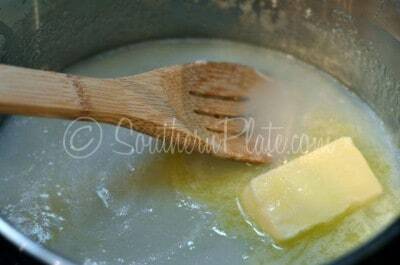 Drop by spoonfuls onto waxed paper or pour all at once into greased 8x8 pan. Allow to cool completely before serving. The recipe for the chocolate version of these cookies can be found by clicking here. If you’d like to watch some of my national tv appearances, I have a few on on my Media/PR page, click here to go there and just scroll down to see all of the videos. Submitted by Jenny. Submit your quote by clicking here. We are peanut butter lovers here, too. I love this change up on no bake cookies! You know, I think you could even substitute Rice Bubbles in place of oats? Do you think that would work? You mean like rice crisps cereal? Definitely! You don’t call them Rice Bubbles?!?! What do you call the Snap, Crackle and Pop?! We call them Rice Crispies! 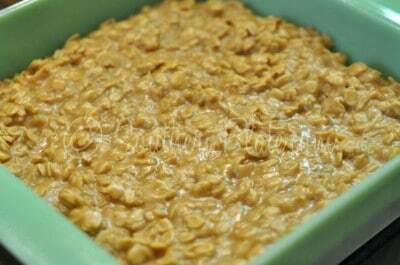 I make these and use corn flakes instead of oats. They are very good!! We call them Peanut Butter Chews. I remember eating these in elementary school but the chocolate kind they are just yummy and bring back such great memories! Yum yum! I am going to try these without chocolate: I don’t remember having these as a kid but did make them for my kids and now my son is the champion of making these with chocolate. I’m gonna sneak em in and see if he likes these as well. We are all peanut butter fans as well. Thanks so much for all you do and have a spectacularly blessed day. My mom always made these, called them Instant Cookies. I never had the chocolate version till I was an adult cuz Mom was allergic to chocolate. When I was home on leave from the Army, she would make me a huge batch and pack it in Tupperware to take back with me. When I was first married, I went through her recipe box and had her copy some of my faves for me and this was one of them. Mom passed away a few years ago at age 73, way before we expected to lose her, so it is especially precious to look through my recipe box and see those few recipes in her handwriting. Will have to try making them in a pan, much easier! Funny you posted this because I just made the chocolate version for this weeks lunch desert! 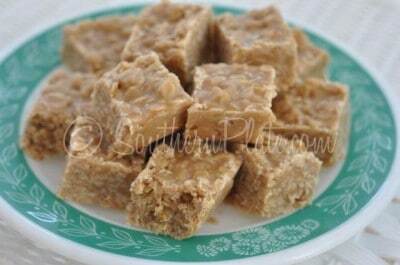 I’m a peanutbutterholic too –can’t wait to make these 😀 Happy Wednesday to y’all!! I think I would prefer these to the chocolate kind; I have a big container of oats I need to use, so these might be made very soon! 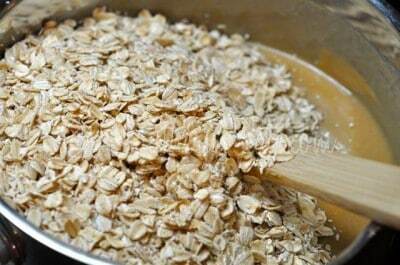 You know, I even like eating oats raw. I’m either very weird or just a diehard oats lover! My mom always made the chocolate version with two dollops of peanut butter stirred in. Peanut butter + chocolate = nothing better! I am going to try this version as Ihave made the chocolate ones for years but never this version. Your hint about not having to drop them is great also as I know one has to work quickly before these set up and it should be much simpler to make the bars. Now I want to respond gently to your wee rant yesterday. Let me preface my remarks by saying I love children. I had three sons which are fine young men now and I have grandchildren that I adore so I am definitely not anti-kids. I do, however, understand why some businesses are not happy when chidren are on the scene. I recently was in a chain restaurant for dinner where two children were literally running up and down the rather narrow aisles. They were running into people and bumping tables and generally creating an unpleasant dinner atmoshere to people trying to enjoy their meal while the parents were oblivious. At one point the waitress had one of those huge, round metal trays loaded with at least six dinners. Those kids nearly bowled her over and I thought I was going to be wearing six dinners. This is dangerous with hot food and potential glass breakage. I spoke to the manager and he apologized profusely but said he really couldn’t say anything. He told me Tuesday was family night with some sort of kid meal promotion and perhaps I should choose another night to come there. I really don’t think that is the answer and I do not think I will be returning on any night. I also have a problem in stores like Walmart where children are crying , stomping their feet, and demanding what they want. This is truly distressing to me. I hate to sound like an old crab, but my goodness, I see I true failing in parents to be teaching manners and self discipline. I often see little wee ones who obviously need a nap or out so late that they should be home tucked in their beds. Parents need to have some responsibilty in their children’s behaviour patterns. OK-now I have had my wee rant and I hope I have not offended , but only wanted to point out there are always two sides to the coin and I feel sure Karo and Brady Bug are not among the children who behave badly in public. Very well put Elaine. I have stopped going to certain eating establishments because management wouldn’t say something to the parents. I tried to raise my girls the way I was raised. There was appropriate behavior expected, most especially in public, and if that behavior wasn’t acceptable there were consequences. I am proud to say that they have grown up into very polite, smart, and good women who make a productive contribution to society. Just proves that the old ways are the best! Oh my, these look delicious! I don’t particularly care for chocolate (I know, I know that’s really odd) but I do love peanut butter. We always made them with peanut butter AND chocolate. The best! I have the recipe stuck back somewhere. I’m racking my brain as to what my grandmother used to call them. Can you substitute shortening for butter? We always made the chocolate ones with peanut butter and chopped pecans. These have been a traditional favorite for Christmas for many years. We call them penny candy. Very good and very easy! Judy do you use pecan pieces and is so how much? I did not have these as a kid, but since we have a little one on the way, I’m looking so forward to starting all sorts of new traditions that will use so many of your wonderful recipes! How funny this is, I just returned home from spending a week in Tennessee with my folks and family for their 55th Anniversary. Two days after the celebration and all the food, family and good times, my Mom made these for my sisters and myself and we watched an old movie we all loved! Talk about bringing back memories, she used to make these for us for after school yummies as we called em, for sleep overs etc. Some things never change, and goodies like these don’t need to! Thanks for your wonderful Blog! love it! My daughter and her cousin make these when they get together. Which is not ofter enough, cousin lives in Birmingham. They called these “Cow patties”. Chocolate of course. I do like the pan version which I will try tomorrow for a church function, I will try it with no chocolate. Sounds yummy!! I’ve never had these, but they look delish. I’ve never made a single recipe of yours that I haven’t liked, so these will be on the list of Christmas treats for the neighbors. Thanks! Yikes….not sure what I did wrong. I used chunky peanut butter. Mine was a little stiff and had to just press it down in the pan. It didn’t really pour out of pot…I just had to “chunk” it out. I cooked it just like in recipe. Maybe I didn’t let the peanut butter melt down good enough. Oh well…still looks good and I’m sure it will taste good. If you find out what you did wrong…. let me know!! They do still taste good, but my “batter” didn’t look as creamy as Christy’s, and it also didn’t pour out. 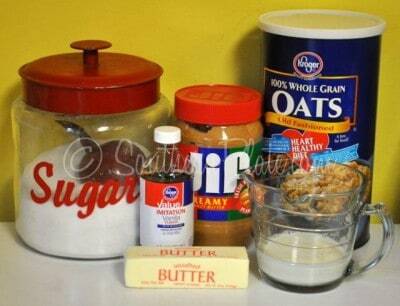 Maybe I will add a little more milk next time, and use a little less oats? I did use the quick cook oats so I have no idea if that makes a difference-did you use quick cook or old fashioned? The oats shouldn’t make a difference in this really. It really sounds like it was just cooked a wee bit too much, perhaps too high or too long? But every stove cooks differently and chances are you’re cooking on a much nicer stove than mine! :) You can certainly add more milk if you like but I’d go with cooking a little lighter first. I hope this helps! My first batch did the same thing. I decided to crumble into large pieces and mixed them in with a batch of granola. Now the household is searching for my granola! 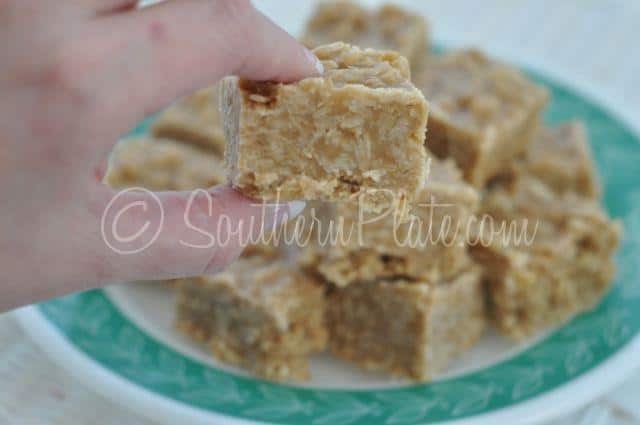 I make these but I use a sleeve of saltine crackers instead of the oats.Love them! OH WOW I bet that’d be GREAT! We love the chocolate ones. I do something similar, I just pour them out of the pan onto a baking sheet then cut them into bars. I can’t wait to try the peanut butter ones, they sound so good! Can you use Splenda or part Splenda for some of the sugar in this type cookie? Christy I know you are a dibetic. could you give us some information on using Agave? Actually I’m not a diabetic at all but I do a lot of sugar substitutions as I can’t have a lot of sugar – my body just isn’t used to it in big doses 🙂 I’ve never cooked with agave but I used it once in tea when a company sent me a sample bottle. I use a lot of Splenda and I love Ideal sweetener though! We always called these “preacher cookies,” but made with chocolate and peanut butter. They’re known that way all over my hometown in Southern Virginia. There are instructions on adding peanut butter to the chocolate recipe on the recipe for the chocolate ones. I love em that way too! I notice for the chocolate no bake cookies you use 1/2 cup butter (my mama does too)…but in these you only use 1/4 cup butter (1/2 stick). Is that correct? Probably because the peanut butter already has so much oil in it. Just a guess. We ate “boiled cookies” as we called them for as long as I can remember. This is the first time I’ve sent a comment but I told myself I had to share what a blessing you are to my day! I log onto my personal email from work several times a daily until I get your email! I often am teary eyed at the stories you share about your sweet family. I love the recipes for us “real folks” that are on a budget but want to feed our family well. I have told everyone I know about the SouthernPlate site since I found you a few months ago. I plan to buy my oldest son the cookbook for Christmas. You really have a ministry here! Youshare the love of Christ by your everyday talk. I am from North Alabama also(Smith Lake area. not on the lake but near it) My husband actually works in Madison. (long drive) Thank you for what you do! You really are awesome! I love it! It’ s always embarassing to realize I didn’t proof read an email & then find several words spelled wrong . Oops! Well honestly, it makes me feel a lot more at home because I do it all the time, only when I do over sixty thousand people know within a few minutes! I never read type-o’s anyway. Your comment looked perfect to me and I sure do appreciate you taking the time to leave it! Thank you so very much for sticking with me, helping spread the word about Southern Plate, and your wonderful encouragement! These were and are still a Christmas favorite in my family, although I never did them as a bar cookie. They were always dropped on waxed paper (like drop cookies) and sprinkled with candy sprinkles or powdered sugar. I like the bar cookie–less mess! 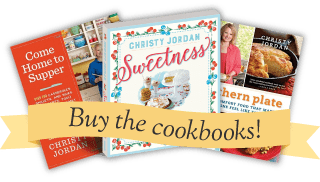 I am really going to be making these soon….but I had to let you know that I LOVE, LOVE, LOVE the photo of you and the family below the button for “cookbook”! It has th old fashioned look of th 40s and 50s which I adore! You not only please the tummy but the eye as well….something not to be said about lots of websites and blogs….thanks so much!!! Thank you so much Sharon, that is one of my favorites too! I sure will be making these with my Grandbabies that are coming this weekend! This may sound funny coming from a girl who’s from the Philadelphia area,but you are by far my favorite blogger AND recipe site! Can’t wait to get your book for Christmas, as my son has promised. I know it’s because he wants your recipes too. I have to forward him your emails all the time! I also have you at the top of my homepage so you’re the first thing I see each morning. I think you can see you’re loved down here in FL.! I love your faith & all that you chat on about too! Thanks so much! My son is going to love these, and I have everything to make them! I’m going to have them ready when he gets home from school – thank you!! !